Heat oven to 350 degrees F. Unroll dough on work surface; separate into triangles. 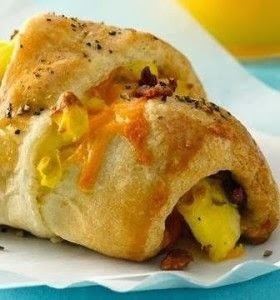 Top each triangle with bacon, scrambled egg and cheese. Roll up loosely as directed on can. Place on ungreased cookie sheet; curve into crescent shape. Brush with beaten egg; sprinkle with pepper. Bake 18 to 20 minutes or until golden brown. To make scrambled eggs in microwave: Beat eggs well in medium microwaveable bowl. Microwave uncovered on High 1 1/2 minutes. Stir cooked outer edges to center. Microwave 1 to 2 minutes longer or until eggs are almost set but still moist.